So this is my second foray into the world of Sia drums, the first being here. That original drum I reviewed had a certain feel to it and this drum has that same feel. It’s a good feel too; solid and quite reassuring I would say. The drum, as you’ll have seen, is made from Red Gum and it’s a 12×7″ stave shell. 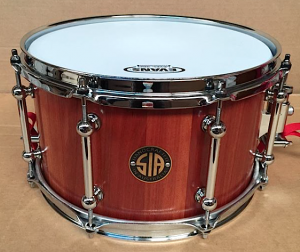 Red Gum is part of the Eucalyptus family and is native to Australia, which is where Sia drums are made. I’ll leave you to work out where the ‘red’ bit comes from. It’s quite a heavy drum, and it’s not because of the hardware as can be the case with some manufacturers drums; it’s a pretty thick shell which isn’t unusual for drums of this construction. The drum comes with triple flanged hoops, Nickel Drumworks strainer, eight double ended tube lugs and 20 strand wires. All fairly standard stuff. Heads are a coated Evans G1 on top and a clear Evans 300 snare side on the bottom. The red snare cord is a nice touch against the colour of the shell. The shell has a fairly narrow snare bed and defined but not overly sharp bearing edges. I have a thing for 12×7” drums. I think it’s a good size in terms of not being so high pitched that it will only do one thing – the depth of the shell gives it a bit more body back from anything you might lose in the diameter. I have at least one 12×5” drum, and it just doesn’t feel the same as the 12×7” drums I have in relation to how it feels to play. Sound-wise, this drum does high, medium and low. High tension means plenty of crack but not so much body. I found that while it does go there, it wasn’t where the drum really had that much character. That came much more in the mid range tensions. On its own, low tension has a nice uniform ring to it which carries on through when playing with the full kit, which actually surprised me a little bit as I thought it might get lost. I didn’t think going this low would be all that useable when in the room at the time, but listening to the recording afterwards I changed my mind on that. It’s probably not what you would use a drum of this size for, but useable at low tension it is. Overall, this is a lovely looking drum but also a great sounding one too. The rich colour of the wood really makes it stand out and as you would expect, it’s been really well made too. Sound-wise, for me it sits best at a medium/lower medium tension just to get some more body out of it, but as you can hear it will go up or down from there as well. And, despite being 12×7”, it’s got a good solid feel to it too.